At Lawrence’s death in May 1829, Eliza Myers was left with 10 year old Henry Bennet, 7 year old Thomas Philip and 7 month old Martha Ann, a stagecoach inn and lots of unsold property. Since Lawrence did not have a will his property went to his children. This week we will look at the oldest and the youngest. Henry's middle name was from his grandmother and originally spelled with one T but eventually a second one was added. Henry Bennet Myers married his cousin Leonora Brown, daughter of Col. Thomas Jefferson Brown of Berkshire Corners. Thomas and Eliza were siblings. Leonora gave birth to Stephen Bennett Myers July 22, 1848, she died in November 1849 and is buried in Berkshire. Stephen married Helen Colby and had 7 children all born in Onawa, Monona, Iowa: Harry Eugene (1878), Lawrence (1879), Leonora Brown (1881), Elridge Bennett(abt 1883), Dan Dean (1886), Henry Bordidge(1888) and Frank Colby (1892). Their son Lawrence had two sons Lawrence and Gail, both have visited Sunbury with Lawrence serving as Grand Marshall in the 175th Parade. Dan Dean Myers grandson George Larson was here more recently. More is available on his website at http://olelarsonsfolks.net . On May 28, 1854, Henry married his cousin Fanny B. Myers, daughter of Lawrence Myers’ brother, Thomas Philip Myers in Kingston, Luzerne Co., PA. To this union three children were born, Harry B. in 1858, Sarah E. in 1860 and Susan B. in 1861. 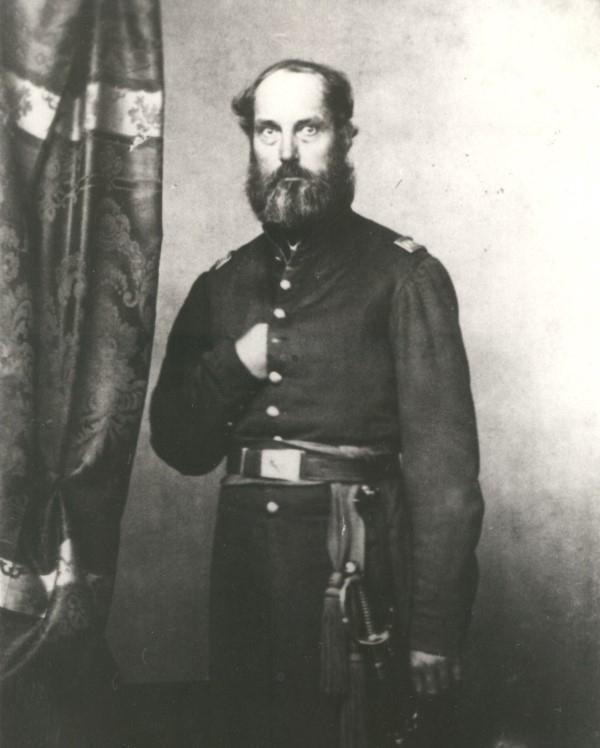 In October 1862 Henry mustered into the 33rd Regiment of Iowa Infantry Volunteers in Oskaloosa. He was appointed Quartermaster (a senior soldier who found supplies for the unit) on August 22, 1862, went to St. Louis, Kentucky, Tennessee, and Arkansas where Henry resigned March 16, 1864 probably in poor health.. He died June 14, 1864 in Oskaloosa. Fanny took the three children to Chicago where she lived with her brother Phillip on the 1870 census. In 1880 Harry B. was a bookkeeper for a fire insurance company living with his mother and sisters. In 1887 he married Luella G. Goodrich then he died in September 1888 and is buried in Forest Cemetery in Iowa with his father. Fanny died in 1909 and is also buried in Oskaloosa. Sarah and Susan were single and living in the Alexandria Hotel on Rush Street in the 1940 Chicago census. There are no known descendants from Henry’s second marriage. Martha Ann Myers was the last child born to Lawrence and Eliza. In September 5, 1847 she married Lyman Spencer Cook, a saddler who was born in New York in 1820. They had a log cabin on the other side of the Wilcox Blacksmith Shop (Payne and Brown Insurance site in 2016) north of the Lawrence and Eliza’s home (Myers Inn in 2016). Edward Lawrence Cook was born in 1848 and Martha Ann on November 11, 1850. A month later the mother and Edward died. Eliza was living with them so she may have continued to do so to help care for the baby. In 1856 Lyman Cook married Crandall Wilcox’s daughter, Elizabeth. Three Years later Martha Ann Cook age 9 died. She was the last of the Myers in this family. Eliza moved to Iowa with her son Henry. Lyman’s parents Spencer and Lydia Cook were living with him in 1860. I suspect they built the second log cabin close enough that the two are enclosed in the frame house at 11 South Columbus Street. Lyman and Elizabeth’s son Henry built the house just south of Lyman’s and had a harness shop south of his house. The house encases two log cabins believed to be the homes of Lyman and Martha Myers Cook in one and his parents in the second cabin. 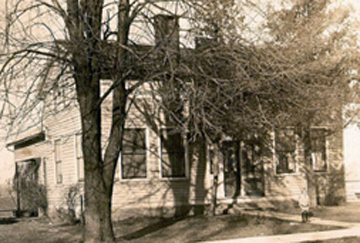 This photo was about 1907 before the porch and dormer were added in late 1920-30. Boy in front is Bill Whitney, father of Polly Horn. Many Thanks to George Larson for sharing his family history and to Paul Clay whose mother's family married into the Myers family. George Larson's Website at http://olelarsonsfolks.net which contains the families of Stephen and Helen (Colby) Myers who are George's Great Grandparents. Henry B. Myers. Age 42. Residence Oskaloosa, nativity Ohio. Appointed Quartermaster Aug.
22,1862. Mustered Oct. 1, 1862. Discharged March 16,1864.